As always, if you decide to play along, feel free to leave a link or upload to SCS with the keyword FTL35! I love this sketch and will be using it a lot. 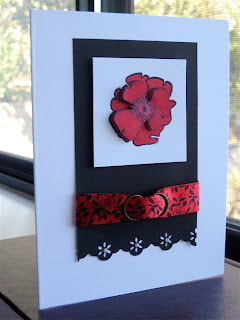 I had to make a red, white and black card for a swap so i used this wonderful layout. 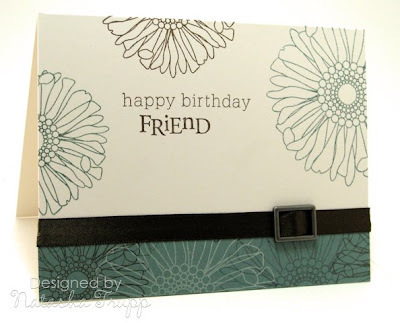 I stamped the image on the white panel and colored it with carkers. 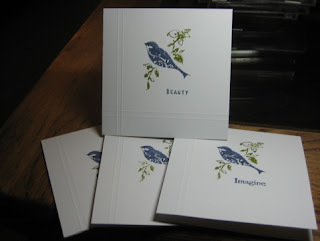 The I stamped it again on another piece of white paper, colored it and cut out a portion of it and adhered it to the originally stamped image with dimesionals. 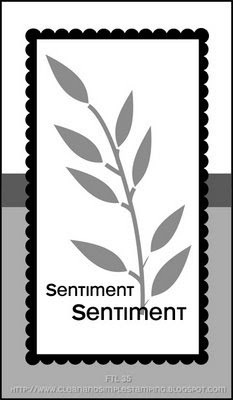 Supplies: Stamps - Inkadinkado; Paper - PaperTrey; Ink - Versafine Onyx Black; Misc - Ribbon, SU! 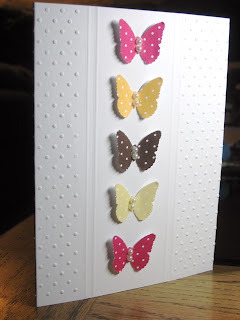 HPH, Fiskars Border Punch, pearls. This card started out as a joke of sorts. My sister was looking through some papers on my shelf, it was the Rock King Mat Pack. 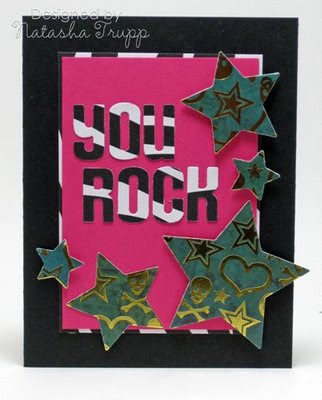 As a joke I said "I'll make you a rockstar card for you while you're at work". 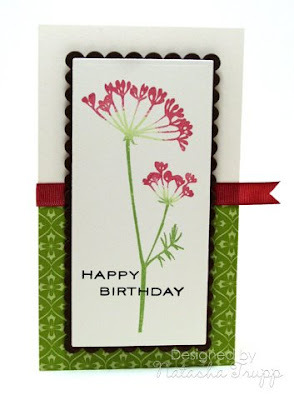 So she chose a paper, then I made her choose a piece from the American Crafts Teen collection. 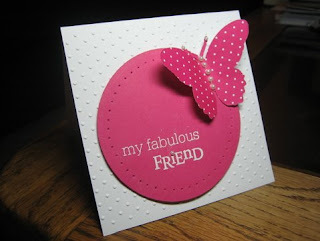 I decided to throw in a bit of Raspberry Fizz cardstock and see what I could come up with. 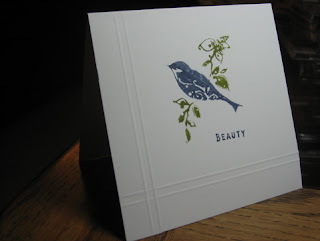 There are no stamps, just various die-cutting, so it didn't take very long at all. 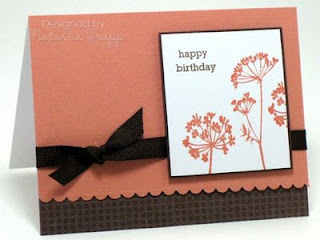 The card's layout is very much my style, but the colours are very much not. I had fun anyway though, and isn't that the point? I kind of like how it turned out. I figured it was time for another square sketch. This one really is just a guideline. I made my card 4.25x4.25, but feel free to adapt it to any size square. 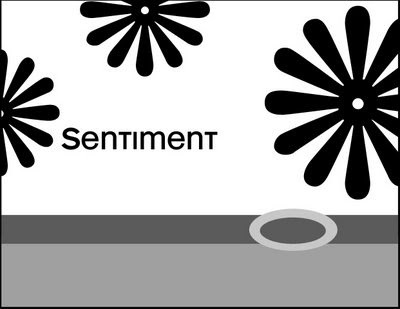 Also, feel free to make that circle any size, and although my extra item is a flower, make it whatever you like! 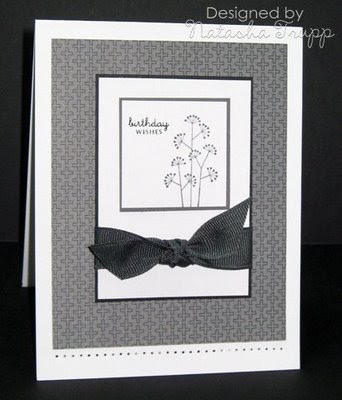 What's great about this sketch is that you can easily apply it to being clean and simple or very layered and done up. When I was getting the sketch ready, I had one set in mind- Friends 'Til the End. 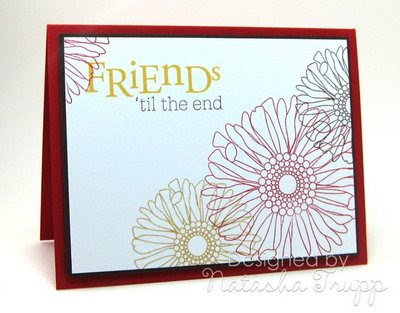 I knew I wanted to use the flower and a sentiment from that set. 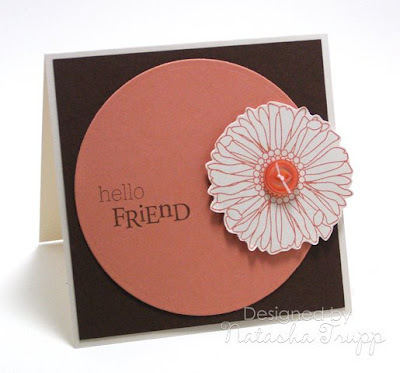 I found a perfect sized button for the flower center from the Melon Berry Vintage button collection. I am also just a little bit obsessed with pairing Melon Berry and Dark Chocolate right now, I threw in some vintage cream for this one (mainly because I already had a flower stamped on a piece when I was making this). I was thinking about what to do for the Ten Minute Monday post and of course went to SCS for inspiration. I really need guidelines most of the time to get started. 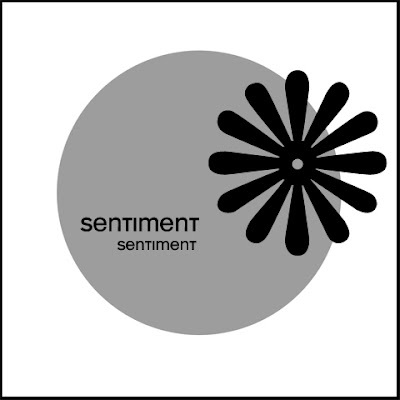 The CAS challenge for the week was just posted - CAS04 Accents with Dots. 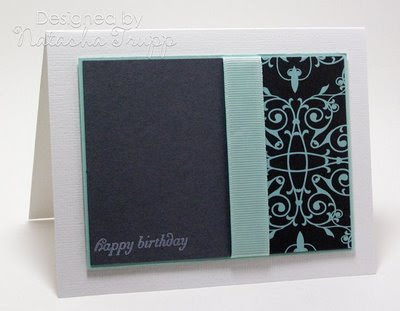 That got me thinking about paper piercing but i don't like to make holes on my card front for a one layer card. 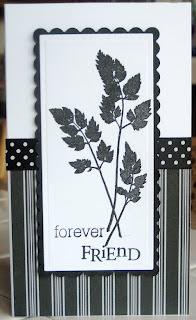 I remembered I had the Bodacious Bouquet stamp set and brass stencil that came with it. I used my SU! 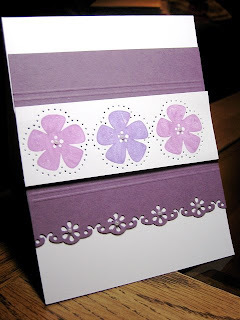 markers to color the flower stamp and used my Stamp-a-majig to line them up. I then used the brass stencil lined up over each flower and pierced around each one. 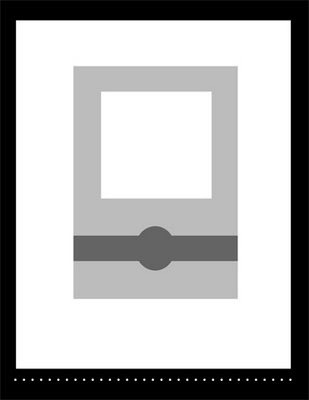 I adhered that panel with dimensionals to the purple pnel and I scored lines above and below the panel. I used a MS border punch on the bottom and then placed little half back pearls in the middle of all the flowers. 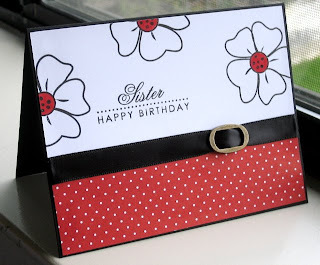 It took longer to write this up than it did to make this card! 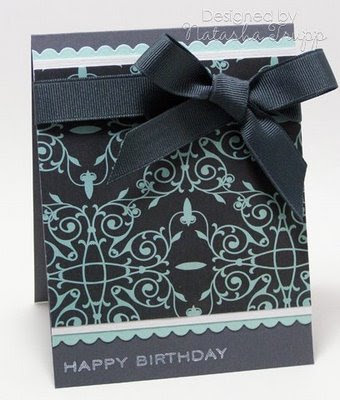 I finally got my hands on the Metropolitan collection of American Crafts paper, so I needed to make a card or two featuring some of that paper. I grabbed this piece and decided to make another card based on this week's sketch. 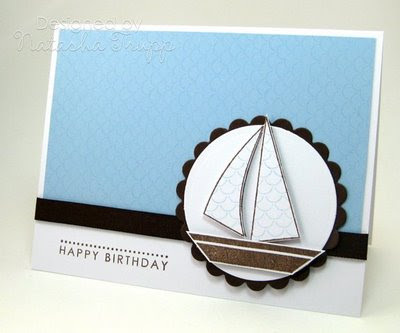 The closest matching cardstock colours in this paper were Aqua Mist and Basic Grey. I threw in some textured white to be a bit different. Since I had the paper out I decided to make another card. This one by Dawn inspired me. I even kept the bow, which only took 3 or 4 attempts. Don't ask how I did it, I never remember. Bow-tying is one of those tricky activities.